ITT Bankruptcy: Scandal, Student Loans, and Unexpected Creditors | Queens Bankruptcy Attorney - Bankruptcy Lawyer in Queens - Bruce Feinstein, Esq. ITT filed for Chapter 7 bankruptcy in September 2016 amidst several federal lawsuits and allegations of predatory student lending. A business Chapter 7 bankruptcy is used to liquidate a business’s assets and pay off its debt obligations. Exemptions are not offered in a business bankruptcy, so all the corporation or LLC’s assets are sold, and proceeds are disseminated among its creditors. In the case of ITT, a wide mix of creditors, former employees, and federal regulators are fighting for these assets. However, irate former students are now entering the ring. 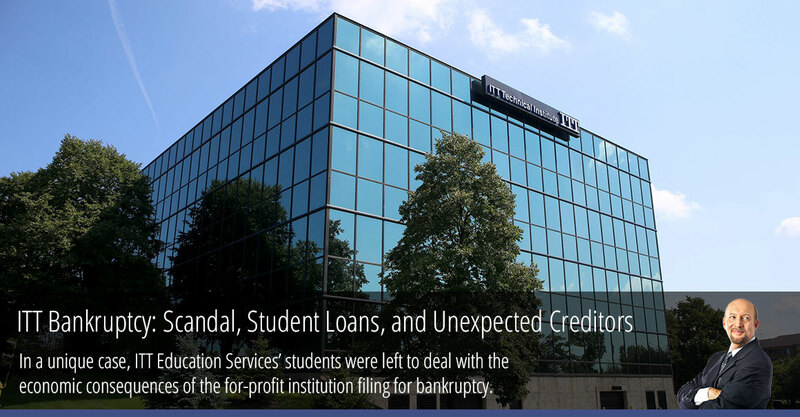 These students were defrauded by ITT, and are suing to be creditors in its bankruptcy case, thus giving them a voice in the bankruptcy proceeding. This also entitles them to the company’s assets. This case also raises the question of how to determine assets in a bankruptcy case. During Chapter 7 bankruptcy, a trustee is appointed to liquidate the debtor’s nonexempt assets/ This is done in a manner that most benefits the financial return to the debtor’s unsecured creditors. In the case of ITT, testimonials from former students and employees claims that the company pushed high-interest private loans that the students couldn’t repay,” says Mr. Feinstein. “So the Court must now decide whether the money collected by ITT and its uncollected loan debt can be considered a legitimate asset. If you are an individual or business owner considering filing for Chapter 11 or Chapter 13 bankruptcy in Queens, New York, Contact the Law Offices of Bruce Feinstein, Esq. today for a Free Consultation.